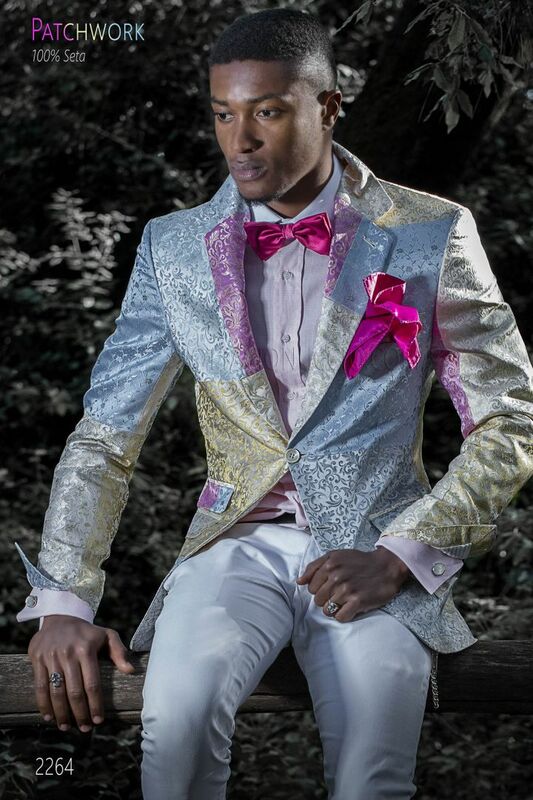 Patchwork jacket for man in pure silk with light tone. Notched classic lapel, flap pockets, ticket pocket on right side ... Patchwork jacket for man in pure silk with light tone. Notched classic lapel, flap pockets, ticket pocket on right side to make the look more casual and two vents at back. 2 corozo buttons with straight buttonholes at front and 3 buttons with straight buttonholes for each sleeve. Buttonholes are open, rounded finish and length suitable for any height.. Shirt made from textured cotton with contrast classic collar. Reinforced exposed placket with signature nacar buttons. D... Shirt made from textured cotton with contrast classic collar. Reinforced exposed placket with signature nacar buttons. Double cuffs for cufflinks.